Create a compact, efficient footprint and maximize available space with the HP VESA Mount Bracket for HP t310 Zero Client, which allows you to mount your HP t310 Thin Client behind a display or insert into an HP Integrated Work Center Stand. Simply slide the HP t310 Thin Client into the Bracket until it clicks into place with the spring loaded snap. 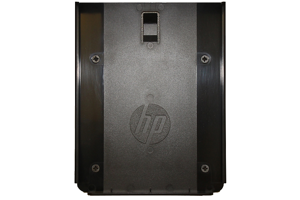 Use the VESA mounting pattern on the back of the Bracket to vertically mount the Thin Client and Bracket to the VESA pattern on the back of a display, or insert into the HP Integrated Work Center Stand.1.